Mach was!? (Do something!?) is the title of an old Swabian jazzrock record that pretty much expresses what this blog is about. Its entries talk about the relation between being and becoming, self-actualization and social change. This is how I perceived and questioned reality at each given point in time, not a statement of absolute truth, a call for getting excited, or a reason for feeling criticized personally. But if you must, you must, of course. While climate scientists naturally keep an eye on human carbon emissions as the main driver of global warming, people like Charles Eisenstein have been wondering whether the problem / solution approach makes any sense in handling the planetary crisis. 'Carbon reductionism', as he calls it, is just an expression of the underlying worldview that created and fostered the crisis; our sense of separateness that makes us think we could manipulate and shape the 'external' world according to our likings. We have failed achieving the desired outcome and instead have created a situation that threatens to wipe out millions of species, our own among them. What makes us think we could find our way out of this with just a little more (geo) engineering? Eisenstein's perspective may not be easy to digest when all you ever believed in were rational thought and scientific research results. But rationality may go wrong and lose its grip on reality quite a bit, especially when its conclusions are founded on assumptions, or doctored data even. Recently I am running more and more often into the assertion that anthropogenic emissions of greenhouse gases had peaked and were levelling around 36 Gtons of carbon during the last three years. Trying to find out where this figure is coming from I discovered what I intuited already: that human industrial gas output has not been measured, cannot be measured, and is utterly based on industrial claims about the amount of fossil fuels burnt. It's all paper declarations. At the same time, greenhouse gas concentrations in the atmosphere have actually been measured and found increasing, with no sign of even the rate of increase reducing. 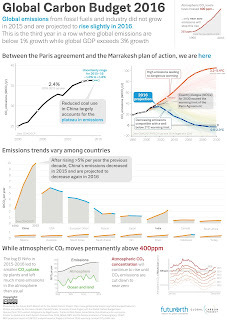 I find it probable that emissions have continued rising exponentially while governments and industries claim they had done their level best to curb them. Nobody can actually know where all the surplus gases in the atmosphere are coming from exactly. We only know they are there, on the rise, and they are here to stay. Until only weeks ago I did not notice a single article in which the claim that greenhouse gases had levelled off has been questioned in any serious way, and I find this somehow peculiar when there is a lot of cynicism going around regarding corporate sources of information. After all, manipulation of deceptive practices to hide global warming and its source have been well documented. 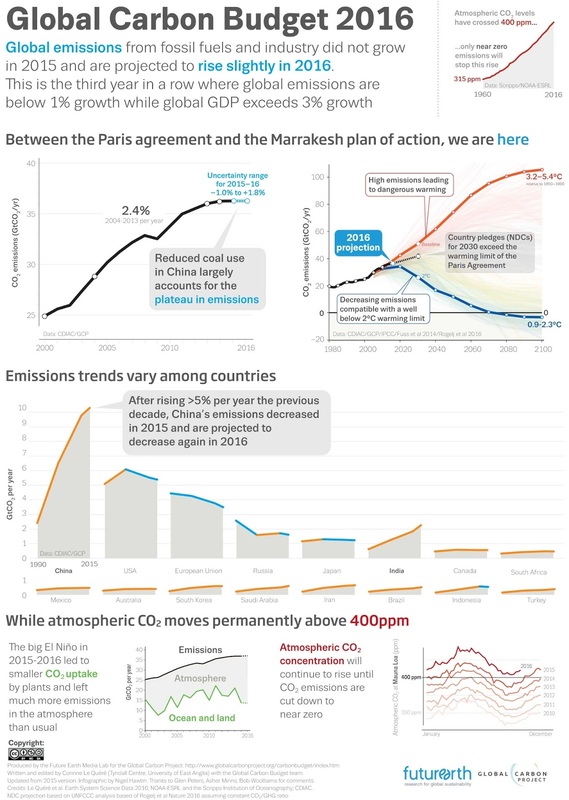 The graph states that the economy is still growing and that the alleged drop in carbon emissions is based on Chinese figures about their coal use. The industry uses those 'level' figures because they seem to show that the age of fossil fuels is over anyway and that it's not worth people's time to think about regulations. They want their fictional carbon budgets last a little longer. Governments embrace the figures because they seem to show that their efforts with curbing global warming are gaining traction and that emissions have decoupled from economic growth. Climate scientists who think civilization can be saved use those numbers to call for more personal action, development of 'green' energy infrastructure, or even financing their pet geo-engineering technology. And the doomer community, yes, it has an interest in upholding those figures as well; after all, the implied growing discrepancy between stalling industrial emissions and rising atmospheric carbon levels strongly supports the notion that Earth's climate has entered a runaway mode of change. When government, industry, and various shades of the environmental movement unite in embracing ominous figures, it makes me wonder what's going on. While we cannot expect industry, corporate-controlled governments, and their gate keeping scientists and journalists to tell the truth, truly concerned people need to take a second look at the assumptions connected to above mentioned figures. Please note that I am not saying that non-human feedback loops hadn't been triggered, just that I doubt the figures delivered by governments and industries. Those are very likely twisted, and certainly not based on reliable facts. Absent solid data, and regarding the root causes of the planetary predicament, what actually needs to happen is a profound rethinking -- or rather, re-sensing -- of humanity's nature and place in the Universe. If we are to come to our senses all of the distractions which keep the mind busy need to fall away: entertainment, belief systems, career, money, consumerism... you name it. The falling-away of all the confusion they cause would shatter our whole way of life, otherwise called industrial civilization. What is in the way? Only addiction and fear. The interesting thing about it is that this is not about doing more but less, and that the way is identical to the goal. Standing in the Fire with Young Climate Activists - Older generations have a moral obligation to stand with youth amid the climate catastrophe. Read the full story here. The Value of Listening - Increasing noise pollution and the loss of silence in our modern world impacts people as well as the environment. Learning how to listen may be one solution.